Above: Yo-Yo Ma, seen here with the Boston Symphony Orchestra, is one of the world's most celebrated cellists. 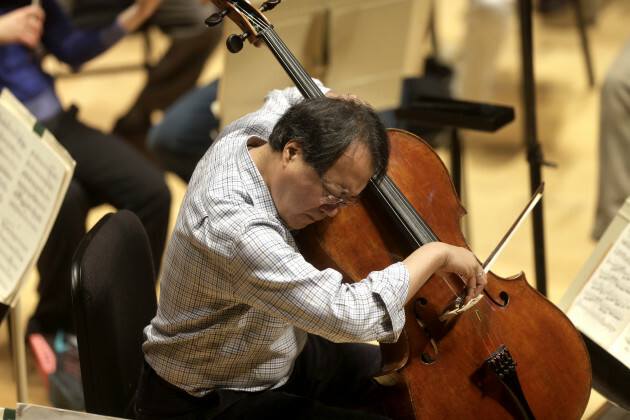 Minnesota Orchestra announced today that superstar cellist Yo-Yo Ma will return to Orchestra Hall for the first time in nearly 15 years. The globe-trotting musician will play with Osmo Vänskä and the Minnesota Orchestra for a single evening on Tuesday, June 13. Ma is scheduled to perform as a soloist in two works: Haydn’s Cello Concerto in C major and Dvorak’s Silent Woods. The Minnesota Orchestra also will perform works by Smetana, Mendelssohn and Liszt. Despite his long absence from Minnesota, Ma has a storied history of playing with our home-state orchestra. He first performed with the band in 1977 under then-Music Director (and current Conductor Laureate) Stanislaw Skrowaczewski and later played under conductors Sir Neville Marriner, Edo de Waart and Eiji Oue. Tickets for the Yo-Yo Ma concert are priced $50 to $175. Those purchasing season tickets for the 2017-18 Minnesota Orchestra season get first dibs beginning March 20. For everyone else, single concert tickets go on sale May 12. Call 612-371-5642 or visit minnesotaorchestra.org for more information.